Have you noticed that your guitar is already looking old? Have you been considering repainting it to make it look somewhat new again? The truth is it can depend on whether you are using an electric guitar or an acoustic guitar. 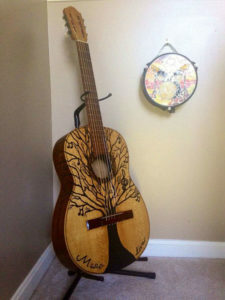 It is okay to repaint an electric guitar, but it is not a good idea to repaint an acoustic guitar for specific reasons. Before you get further details as to why you can repaint an electric and not an acoustic, it is best to know some points that differentiate the electric type from the acoustic one. Amps and power are vital for electric guitars to function at their best, whereas there is no need to use any other equipment for acoustic guitars to work. Guitarists use electric guitars to play rock music or metal music, and such type of music played along with electric bass guitar and drumbeats. On the other hand, guitar players use acoustic guitars so that they can produce bluegrass, jazz, country or folk rhythms, which are often accompanied by the fiddle, vocals or the piano. When it comes to cost, you will need to spend around $300 or more to get a good electric guitar, including its amplifier, cables, and other equipment, but you will only have to pay about $150 for a quality acoustic guitar. Regarding the learning curve, beginner students will most likely find it easier to learn how to play the electric instrument since it can be set up quickly, there is not much pressure required when pressing the strings and there is only a little space between the strings and the frets. Speaking of their strings, electric guitars consist of thinner strings. That is why you do not necessarily have to press the strings so hard when you are playing an electronic instrument. On the contrary, acoustic guitars have steel strings that need to be pushed harder to produce any sound. That is why it can mainly be difficult for beginner students to learn how to play an acoustic instrument. The body of the electric guitar is smaller, and its neck is thinner, but the body of the acoustic guitar is more significant, and its neck is thicker. When you see any chipped paint on your electric guitar that makes it look unattractive, you most probably want the guitar to look new again. Perhaps you want to change the color of your guitar as well. Whatever is your reason for repainting your electric instrument, it is okay to do it. In fact, there is something good about repainting the electric guitar. First, your guitar will look original and different from the ones people usually buy from a guitar store. Second, you can paint it with what color you like. Third, you can add a few designs of your choosing as you color it. Fourth, you can express part of your personality through the appearance of your guitar. Last, you will save on the cost since you do not need to purchase a new guitar as repainting it with the use of spray paint will give it an original appearance. When you repaint your guitar, be sure to get the recommended type of paint for guitars such as lacquered paints from a guitar store since it could be selling the color that you like for your guitar. If you are using spray paint, go for the automotive spray paint and not the regular one. Follow the instructions on the paint label before applying makeup on your guitar. Ask advice from friends who have already repainted their guitars as they can give you some great information. Get yourself a copy of the step-by-step guide on repainting electric guitars and follow it to the letter. If it is your first time to do the painting job, it is wise to try repainting the oldest and the cheapest one first, that is, when you have several electric guitars. The reason for this is because you will not find it a significant loss and regret too much if you make a mistake for the first time. Moreover, keep in mind that you have to do the painting job on a step-by-step process, which can take several weeks. 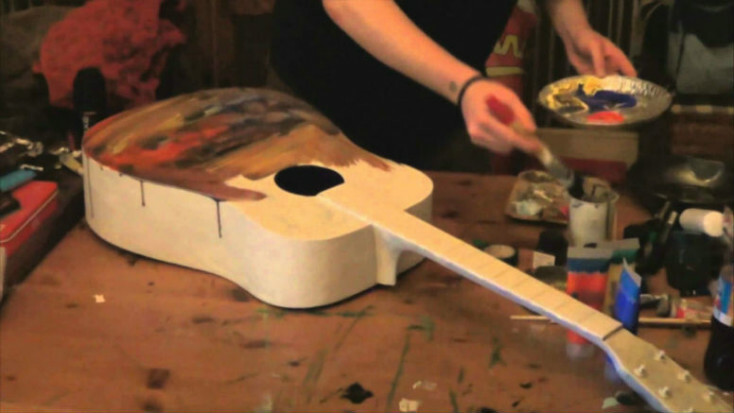 Just don’t rush and observe extra caution while painting your guitar. Some people who use an acoustic also wish to paint their guitar with a new color. 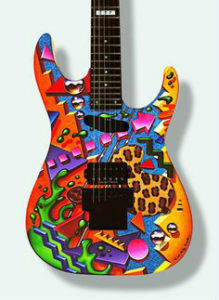 However, although repainting electric guitars is acceptable, it is not advisable to repaint the acoustic variety. You might hear some people say that it is all right to paint your acoustic again, but not all people succeed at repainting their acoustic guitars since they end up damaging their guitars and tossing those away since the paint ruined their guitars. Therefore, if you have a high-end acoustic guitar or one that you genuinely consider to be precious but don’t like its color, be grateful that you have only dropped the idea of repainting it. 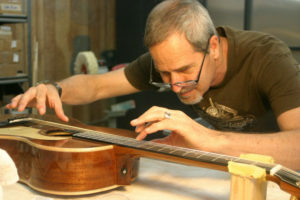 Acoustic guitars do not necessarily have to be repainted since the manufacturers have already provided the most suitable paint for the acoustic guitars to look good and sound good. In fact, they plan very carefully on what type of color and how to paint the guitars to be able to make excellent-quality ones. In other words, they carefully select the right materials and paint for every acoustic guitar that repainting your acoustic guitar yourself will not only change its quality but will also mostly affect its sound. For this reason, your guitar will also lose its original appeal. Also, a certain level of expertise is necessary on the part of the one painting the guitar so that the guitar gets a good painting or design. You will most likely distort the looks of your guitar if you are not very careful about your choice of paint and do not know how to do the painting job well. Furthermore, you must remove some of its parts before repainting it, and you will end up wrecking your guitar if you do not know how to put those parts in the right place after the repainting is done. Last, it can take time before you can finally see the results. You will have to wait patiently and follow every repainting instruction meticulously lest you will only regret in the end for doing the wrong thing. Whether you own an electric or an acoustic, your guitar deserves all the best when it comes to maintaining it. As long as your guitar works fine and sounds great, you do not need to purchase a new one. All you have to do is to take care of it well so that it stays and looks good as new. You will never have to buy a new guitar now and then when you follow the tips below. When you maintain your guitar, you will need several things to help you clean or polish your guitar. You should store these materials in a separate place so that you can quickly get them whenever you need them. The documents include a screwdriver, an amplifier, a tuner, sets of strings, guitar detailers, guitar waxes, polish pads, microfiber cloths, guitar polishes and paint-cleaning clay. You may buy them from online stores or manufacturers that specialize in guitar-cleaning products, department stores or some guitar stores. You have to keep in mind that too little moisture or too much of it can damage your guitar. If the amount of humidity is excellent, this will affect the crispness of the sound. When the temperature is too dry, the neck of the guitar will tend to shrink causing the frets to stick out. As a result, your fingers could get hurt as you play. Cracks in the body of the guitar will also start to develop when it is dry enough. It is best to procure a reliable guitar hygrometer and humidifier. Moreover, your guitar must be stored in an area that is slightly humid. When your guitar is not in use, store it in its case. You should not leave your guitar anywhere such as on a sofa or your bed unattended as someone, or you might accidentally sit on it. You must also avoid drinking water or any beverage right beside your guitar. Spilling any liquid on your guitar will certainly not do any good to your guitar. Make sure that the guitar case is latched securely right after you place your guitar in it to prevent your guitar from falling out when you pick up the case. It is also important that the guitar fits perfectly in its case. Use a separate pocket or bag to store the tuners, picks or other things as these can scratch the finish when you place them inside the case along with the guitar. Be careful where you put the straps as well since they might be coated and might also ruin the finish of the guitar, so do not place them right under or on top of the guitar when storing them in your gig bag or guitar case. Polish your guitar regularly at least one time every week with the use of a good polish and dry cloth. However, it is good to buff your guitar after playing to remove any finger grease. Clean the guitar thoroughly now and then to maintain its color. Use the appropriate guitar-cleaning products to prevent any discoloration or damage to your guitar. In some cases, some people do not change the strings until one is broken. However, try to change the strings when you notice any dull sound as this does affect not only the quality of the music but also the quality of your playing. The strings need to be wiped down after playing to keep them free from grease. Yes. Strumming your guitar on a regular basis will make the guitar sound at its best sooner or later. The more you play your guitar, the better it will sound. Try playing many different tunes with it. Be sure to play various songs as well. In other words, the more you spend time practicing, the smoother it feels on your fingers when you strum your guitar. When your guitar does not sound right, you will only defeat your purpose of playing any song well. You certainly do not want to play out of tune, and you also do not like your guitar to sound out of tune either. That is why try to use a good tuner or better yet hire a professional who can help you tune your guitar accurately. Nowadays, there are many different varieties of guitars. Some may have a different wood material. Others have a unique kind of finish. That explains why you cannot just use regular glue or wrench in fixing a guitar these days. It is possible that a particular type of finish will need a specific kind of glue. Also, a specific wrench might be required for repairing the neck. That is why try to have the instrument checked by a professional who knows well about fixing a guitar once you notice any defect in it. For instance, when you see any cracks, consult the advice of an expert repairman immediately. You will then be told whether it can still last for a while or not any longer. The thing is when you keep playing a slightly defective guitar, it won’t be long until you need to replace it. Therefore, have your guitar fixed by an expert right away. When you do so, you can use your guitar longer and avoid buying a new one at a time you least expect it.